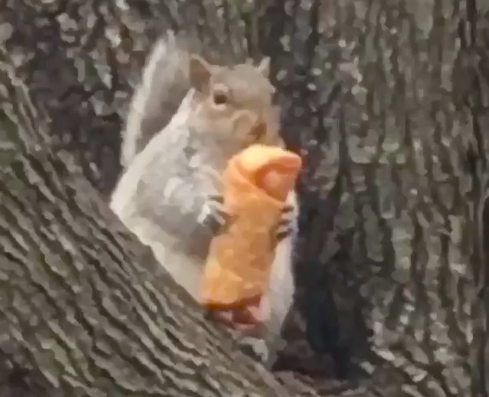 We’re only four days in to the new year, but a video of a squirrel devouring an egg roll has given us the hero 2019 needs. Do you remember in Ice Age when the squirrel tried desperately to hold on to his precious nut, but never actually ate it? I think I gave up on the films after Dawn of the Dinosaurs, but I can pretty safely assume he was still at it way into the most recent film. From Ice Age in 2002, to Ice Age: Collision Course in 2016, it’s been 14 years of attempts to protect a nut, rather than simply enjoying the taste of it. The furry animal in this video recognised he had something good, and devoured it before any flirtatious squirrels, or shifting of the natural elements could take it away from him. The location of this strange scenario really adds to how amusing it is, because this isn’t the average small spring roll we get in England; this is a chunky American egg roll – but it certainly doesn’t look like it’s too much for the ambitious creature to handle. Despite the fact it’s almost the length of his entire body, the squirrel gripped on to its meal and set about devouring it. I’m sure we all have a few questions about how the squirrel came to be enjoying an egg roll, though the animal itself is the only one who’ll ever know the truth. While I’m slightly confused as to who would abandon a perfectly good appetiser for the squirrel to find, the most pressing question is clear; how did the squirrel manage to scale the tree while still holding on to its huge meal? Did it wrap the fried food in its tail to free up its hands for climbing? Or perhaps it found a way to get its whole mouth around the egg roll before beginning the assent? Maybe, just out of shot, is a branch leading to the open window of a Chinese restaurant? We’ll never know. But what matters is it happened, and the video of the egg roll-loving squirrel has kicked the new year off to a great start. 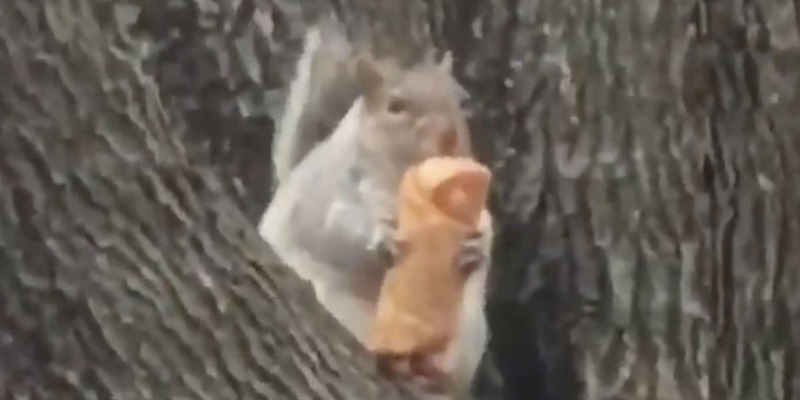 Twitter users have been sharing their appreciation for the hungry creature, and someone has even set up a Twitter account for the little grey animal, appropriately named ‘EggRollSquirrel‘. One person pointed out the hilarious scene wasn’t quite as unique as we might have originally imagined, as she shared another picture of one of the (apparently) Chinese food-loving creatures from Oswego, New York. Not an entirely unknown phenomenon. Maybe it’s just New York State-based squirrels who’ve developed an affinity for Chinese food? Without being too stereotypical, I’d imagine they’d have more access to bagels and pizza than anything else, but perhaps egg rolls just take precedent over other cuisines for the animals? Whatever the story behind it, it certainly makes for an entertaining watch!